Some critics like Gregory Hickok of UC Irvine have argued that there is little evidence to support the mirror neuron theory of action understanding. How do you respond to that? So Rama admits that the theory is based on circumstantial, rather than more direct evidence. I will agree with him that we often do develop hypotheses based on circumstantial evidence, or even intuition. And there's nothing wrong with that. I've pointed out previously that the initial proposal regarding the function of mirror neurons was reasonable and interesting. However, as more and more data poured in over the next two decades, many empirical problems with the theory have been revealed. To use Rama's example, the fact that cones fire to specific wavelengths of light is highly suggestive of a role in color vision but this is still just a correlation. In the case of cones though, much other research has confirmed the hypothesis more directly such as cases where cones are dysfunctional and color vision is disrupted. The mirror system has been put to a similar test, but unlike the cone theory of color vision, the mirror neuron theory of action understanding has failed miserably: disruption of the mirror system does not cause substantial deficits in action understanding (see this post, for example). So the mirror neuron theory is based on circumstantial evidence and there is direct evidence to the contrary. Open and shut case in any court of law. Why isn't the cased dismissed in academic circles? The mirror neuron theory of action understanding is so simple and powerful and the correlations between neuronal activity and behavior so compelling at first glance that it apparently blinds many researchers from seeing the broader array of facts. In one comment in the Mirror Neuron Forum I compared the situation to the powerful intuitive pull of the notion that the sun revolves around the Earth. It is a compelling observation that led to a very reasonable geocentric theory. However, upon further observation the theory failed to account for other, less intuitively compelling but equally valid observations such as apparent retrograde motion of planets. While a geocentric model can explain observations about the apparent motion of the sun, only the heliocentric model explains all the facts. It's an extreme example, but the logic is the same. It is time that we all look a bit more closely at ALL the facts when thinking about the function of mirror neurons and the mirror system. Here is some commentary on Iacoboni’s response to my answers to question 1. In Mukamel et al. it was reported that cells in the human medial temporal lobe respond both during action execution and action observation. We could argue about whether or not these are “real” mirror neurons in sense of functioning to support action understanding given that they are outside of the motor system and as such not likely to be involved in motor simulation. But that is beside the point. The question is whether the existence of mirror neurons in the human hippocampus calls into question my claim that the dorsal stream mirror system supports sensory motor integration while the ventral stream supports action understanding. As a single data point, the existence of hippocampal mirror neurons is irrelevant to my claim. We can see this clearly if we consider the same argument in a different context: suppose I claimed that neurons with an ON-center Off-surround receptive field were critically involved in pitch perception in auditory cortex and someone countered that ‘it is more complicated than that because ON-center Off-surround cells have been found well outside the auditory system including the retina’. The argument misses the point completely. I agree completely. MNs could in principle be involved in multiple processes. But again, it’s an empirical question. My point is simply that the empirical record as a whole does not support the action understanding interpretation. This is a continuation of my commentary on the recently published Mirror Neuron Forum. The start of this thread can be found here. “Neurons responding to the observation of actions done by others are present not only in area F5. A region in which neurons with these properties have been described is the cortex of the superior temporal sulcus (STS; Figure 1) (Perrett et al. 1989, 1990; Jellema et al. 2000; see Jellema etal. 2002). Movements effective in eliciting neuron responses in this region are walking, turning the head, bending the torso, and moving the arms. A small set of STS neurons discharge also during the observation of goal-directed hand movements (Perrett et al. 1990). If one compares the functional properties ofSTS and F5 neurons, … [the] STS appears to code a much larger number of movements than F5…” (p. 171). This evidence is no less correlative than the evidence from F5 but it is evidence nonetheless, in contrast to VG’s statement, and no less valid than the correlative evidence from F5. Further, given that STS units appear to code a wider range of movements and do it with more specificity than mirror neurons, it is clear that the circumstantial evidence for STS being the seat of action understanding is stronger than that for the mirror system. So that’s the end of Gallese’s response to my answer toquestion #1. I see nothing in his rebuttal that carries even a hint of theoretical or empirical weight. Cattaneo, L., Caruana, F., Jezzini, A., & Rizzolatti,G. (2009). Representation of goal and movements without overt motor behavior inthe human motor cortex: a transcranial magnetic stimulation study. Journal ofNeuroscience, 29(36), 11134-11138. Rizzolatti, G., &Craighero, L. (2004). The mirror-neuron system. Annual Review of Neuroscience,27, 169-192. Does damage to Broca's area cause speech perception deficits? The field seems to be a bit divided on this question as the following quotes indicate. A critical piece of evidence in this debate is the speech perception ability of individuals with damage to Broca’s area and/or Broca’s aphasia. 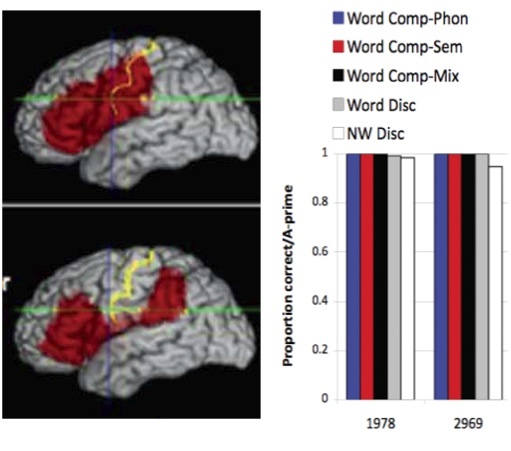 Proponents of the view that damage to frontal, motor-related regions are critically involved in speech perception often refer to the literature of the 1970s and 1980s which reported various degrees of impairment on some speech perception tasks. But this older literature did not typically utilize neuroradiological data to confirm the location of the lesions, nor did these studies use signal detection methods. I recently had the opportunity to team up with one of the major players in that earlier literature, Gabriele Miceli and his group, to re-examine this issue in a new sample of aphasics. From Miceli’s database of patients, we identified all of the cases that had substantial damage to Broca’s area, confirmed radiologically; the lesions typically involved surrounding regions as well. Twenty-four cases were identified. Nineteen were classified as Broca’s aphasics, 5 were on the border between Broca's and conduction aphasia, and 1 was classified as a conduction aphasic. We assessed the ability of these patients to perceive speech sounds using a variety of tasks including same-different syllable discrimination and auditory word-to-picture matching with phonological and semantic distracter pictures. 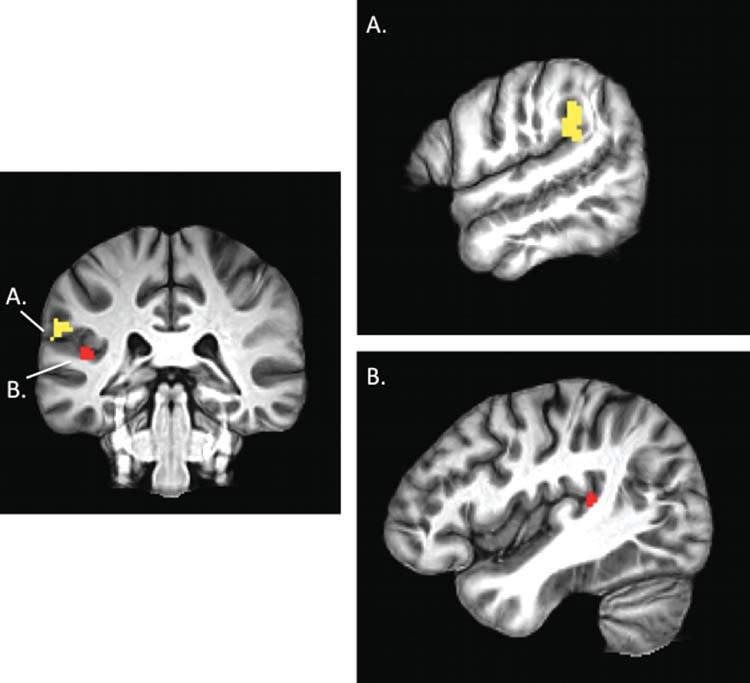 Of course, if Broca’s area and surrounding motor regions are critical for speech sound perception, we would expect to find substantial deficits on our tasks. In fact, performance was remarkably good. On the syllable discrimination task the group averaged 94% correct with a d’ = 4.18, i.e., 4 standard deviations above chance performance. On the auditory comprehension task, performance was even better at 97% correct. Task still matters! Speech output fluency varied across the sample. There was one fluent aphasic in the sample (the one not classified as a Broca’s aphasic). The rest were all non-fluent to various degrees, consistent with the diagnosis of Broca’s aphasia. We removed the fluent patient then grouped the rest in terms of their severity of non-fluency -- mild, moderate, severe -- and examined receptive speech abilities as a function of output fluency. If there is a relation between motor speech ability and speech perception, more severely non-fluent patients should perform more poorly on receptive speech tasks. There was no difference between groups (p-value = 0.39). Thus, the stroke/aphasia literature is consistent with evidence from Wada studies, developmental anarthria studies, normal development studies, and animal studies of speech perception: the motor system is not necessary for speech perception. 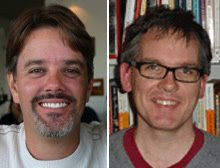 Wilson, S. M., & Iacoboni, M. (2006). Neural responses to non-native phonemes varying in producibility: evidence for the sensorimotor nature of speech perception. Neuroimage, 33(1), 316-325. The Department of Linguistics at the University of Illinois at Urbana-Champaign invites applications for a full-time, tenure-track position in Second Language Acquisition with specialization in psycholinguistics, neurolinguistics, or cognitive neuroscience of language, at the rank of Assistant Professor. The candidate must possess demonstrated strength in theoretical and/or experimental linguistics. The candidate's record should provide clear evidence of a strong research program and an excellent research trajectory. The successful candidate should demonstrate a commitment to excellence in teaching, and will be expected to contribute to both undergraduate and graduate instruction. Research specialty in one of the languages offered by the Linguistics department or another department in the School of Literatures, Cultures and Linguistics is a plus, as is experience in second and/or foreign language teaching. The PhD should be in hand prior to the target date of appointment, August 16, 2012. Salary is commensurate with the experience and qualifications of the candidate. To apply, create your candidate profile through https://jobs.illinois.edu <https://jobs.illinois.edu/> and upload the following application materials through this system: letter of application, CV (including phone number and e-mail address), contact information for 3 references, up to 3 representative publications, statement of teaching and research interests, and teaching evaluations or other evidence of strength in teaching. Referees will be contacted electronically upon submission of the application. Only electronic applications submitted through https://jobs.illinois.edu <https://jobs.illinois.edu/> will be accepted. For further information please contact: Professor Tania Ionin, C/O Marita Romine, SLCL-HR@illinois.edu. To ensure full consideration, all required materials must be received no later than December 1, 2011. Letters of reference must be received no later than December 8, 2011. The department highly recommends that complete applications be submitted prior to Dec. 1, to ensure that referees have enough time to submit their letters of recommendation. The University of Illinois is an Affirmative Action / Equal Opportunity Employer and welcomes individuals with diverse backgrounds, experiences, and ideas who embrace and value diversity and inclusivity (www.inclusiveillinois.illinois.edu <http://www.inclusiveillinois.illinois.edu/> ). Mirror neuron-like simulation in the sensory system? I've been busy lately working on a grant proposal so I have not had a chance to continue my comments on the recently published Mirror Neuron Forum. There hasn't been any involvement in that discussion by the forum participants anyway (unfortunately) so my motivation to work on it has dropped off a bit. I'll get back to that soon. Right now I'm just curious if anyone has noticed that the mirror system has extended its reach into sensory systems. A recent review by Keysers, Kaas, and Gazzola (2010), for example, discusses the role of somatosensory cortex in social perception via simulating the experience of others. I haven't looked at this literature carefully, but on first glance it strikes me as rather odd to claim, as a novel idea inspired by mirror neurons, that sensory systems in the brain might be involved in sensing what is happening in the environment. What will the next claim be, that the visual system is important for object identification via simulation of object features? Radical! I must be missing something. The Language, Action, and Brain Lab (http://lablab.hamilton.edu/) at Hamilton College is seeking a postdoctoral-fellow interested in understanding the organization of language and the brain from a more naturalistic social, developmental, and cognitive neuroscience perspective. We seek an individual who has recently graduated with a Ph.D. and who has experience with eye-tracking, high-density electroencephalography (EEG), and/or functional magnetic resonance imaging (fMRI) and evidence of productive research. Applicants will be working with a large number of highly intelligent and motivated undergraduate research assistants. There is opportunity to work in collaboration with the nearby Center for Language and Brain (http://www.colgate.edu/academics/centersandinstitutes/languageandbrain). Hamilton College is located at the foot of the Adirondack Mountains in beautiful New York State and is within driving distance of New York City. The position is for two years and offers a competitive salary (funded by NIH-NICHD R00 HD060307 – “Neurobiology of Speech Perception in Real-World Contexts”). To apply, please submit a curriculum vita, cover letter, two letters of recommendation, and representative publications to Dr. Jeremy I. Skipper at jskipper@hamilton.edu before December 1st. The position will begin when filled. Hamilton College is an affirmative action, equal opportunity employer and is committed to diversity in all areas of the campus community.